Millions of tonnes of waste are produced every year by the agri-food industry. Disposal by landfill or incineration is already expensive and the industry faces increasing costs for the removal of refuse and remnants. The costs of energy and water are also significant for food businesses and savings can be made in these areas if the quantity of energy and water used is limited. Methods to recycle and reduce the need for disposal are therefore increasingly of interest. Volume 1: Reviews research in the field, covering optimisation of manufacturing procedures to decrease waste, reduction of energy and water expenditure, methods to valorise refuse by co-product recovery and techniques to deal with wastewater and solid waste. 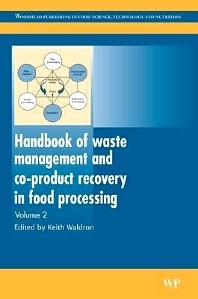 Volume 2: Opening chapters in Part one cover economic and legislative drivers for waste management and co-product recovery. Part two discusses life cycle analysis and closed-loop production systems to minimise environmental impacts in food production. It also includes chapters on water and energy use as well as sustainable packaging. Part three reviews methods for exploiting co-products as food and feed ingredients, whilst the final part of the book discusses techniques for non-food exploitation of co-products from food processing. Source of marine enzymes; Processes and biocatalytic characteristics; Bioprocesses; Biocatalytic characteristics.